A comprehensive cooperation agreement was signed between Xishuangbanna Tropical Botanical Garden (XTBG), <?xml:namespace prefix = st1 ns = "urn:schemas-microsoft-com:office:smarttags" />Chinese Academy of Sciences and University of Science and Technology of China (USTC) on July 15 at Menglun, the headquarters of XTBG. As the representatives of two sides, Mr. Peng Daiping, deputy director of XTBG, and Prof. Niu Liwen, executive dean of School of Life Sciences, USTC signed the contract. 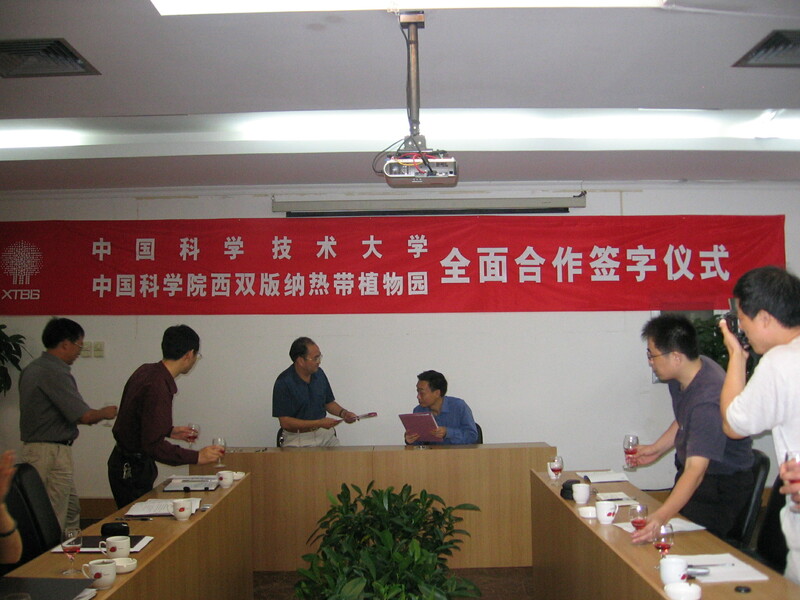 The signing ceremony was presided over by Mr. Li Hongwei, XTBG assistant director and leader of the Personnel and Education Department. At the signing ceremony, Mr. Yin Shouhua, also XTBG assistant director and an associate professor, gave an overview of the Garden on the scientific research, species preservation, public education, personnel training and international cooperation, etc. Correspondingly Prof. Niu Liwen made an introduction about the USTC and its School of Life Sciences. Prof. Niu’s introduction covered the historical evolution, organizations, faculties, subject advantages, employment of undergraduates, scale and quality of graduate education, laboratory platform construction and future development programming. According to the agreement, comprehensive cooperation activities will be carried out between the two sides in the near future. Further cooperation may be deepened and extended.